Here in Guanajuato, clouds are so low that the city is in a fog. Fittingly, too, because I’m so disoriented by news coming out of Oaxaca. To look at photos of a place I wandered through in happy bliss as I absorbed my first real “culture-shock” city. Now I see fires raging and automatic gunfire echoing in the night on video feeds. I see photos of the actual dead riddled with bullets and blood pouring from head wounds. I can’t process it, really. I was there, I was happy, I left, and bloodshed soon unfolded. I already wrote about the day I left the city, and that really did fill me with pause. To retell it now, well, basically my drive to the airport at 9:20am was held up by four lanes of gridlock. Finally we were diverted to the opposite-traffic lanes and got to see the problem – thousands of teachers marching to the airport to shut it down. Because that’s how they roll. Upon reaching the airport, I saw dozens of riot police waiting for the teachers. It boded badly for the days to come, but not this badly. Roadblocks began to escalate in late May. I left the morning of May 26th. Yesterday was a day of bloodletting and clashes, largely stemming from protests road-blockading for days now. 37 roads, by some account, including the highway leading to the Pemex oil refinery. God knows oil is everything these days. 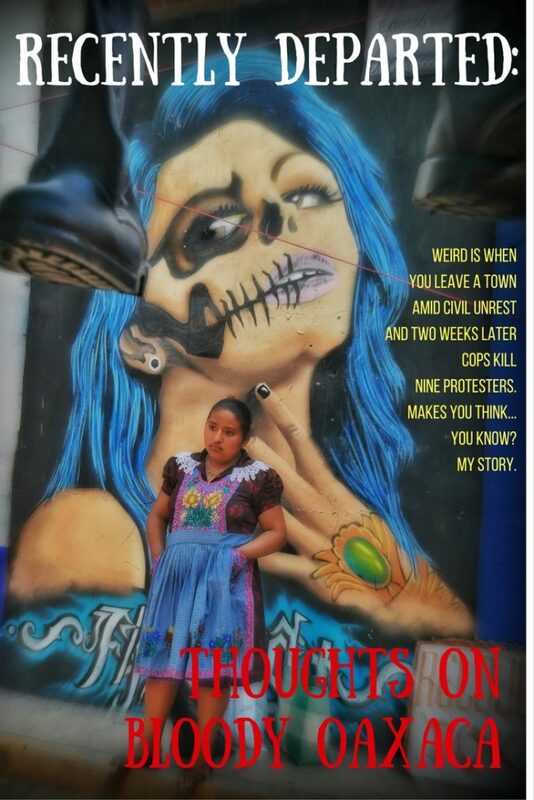 Standoff in Oaxaca. Photo by EFE on @Telesurenglish. I may have journalism training, but I’m not on the ground there, I don’t speak Spanish. I don’t have contacts to keep me in the loop. So I won’t go off speculating about the whyfores, the wherefores, and what it all means. But I’d be lying if I said my heart wasn’t breaking a little today. I had a hard time explaining why I wanted to leave Oaxaca. Often, I felt I was weird to not “get it” in a way that compelled me to stay. After all, so many other travel bloggers and scenesters rave about what a unique town it is. Some feel it’s the next Barcelona or something, and others just really dig its cultural brew. I do get that. I understand it and won’t even debate it, but there was something more to Oaxaca for me on an often-ephemeral level. Still, I couldn’t get past the sense of fomenting discontent that seemed palpable everywhere I went. The surfers used to use the term “harshing my vibe,” and that’s what I felt in Oaxaca. 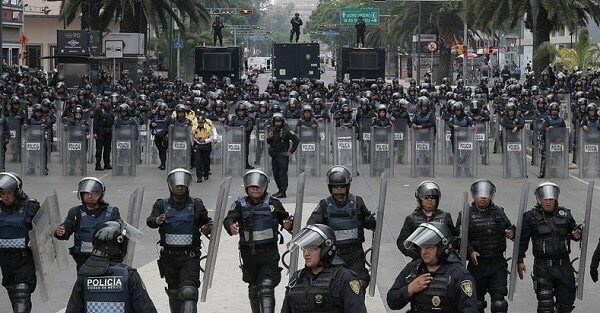 The militarized police in Mexico make most of Canada’s look like amateurs. Food, art, culture, music – Oaxaca’s an amazing place as much defined by the passion it has as it is the discontent that breeds the passion. Great artists, after all, are usually people with troubled pasts filled with extensive struggle. Happiness doesn’t inspire great creations and it never will. Enter Oaxaca with passions and angst forever simmering at the surface, creating an inarguably unique place and time. I may have my own troubled past, but I’m not looking for a troubled present. I can’t be in that climate and not be aware of it. That, I soak up like a sponge. Oaxaca, then, almost felt back-lit to me. There was brightness but it coexisted with a darkness that I couldn’t ignore. My first three weeks there were pretty enjoyable, and I was aware of those feelings. Instead of three months there, I decided to leave three weeks after my return from Vancouver. Four days after my return, a day spent exploring Tlacolula Valley saw me come back to Oaxaca to find seemingly endless streets covered in tarps and tents. 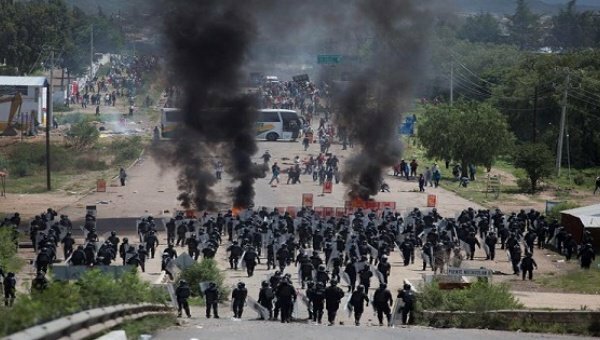 And so began the teacher’s union occupation of Oaxaca, leading to this past weekend’s events, blood spilled and lives lost. Oaxaca on better days, just a couple blocks from all this past weekend’s bloodshed. That Sunday night six weeks ago, Oaxaca became more unsettling to me. I knew about the history with that union, that 10 years ago had been a bloody revolution that led to 17 deaths. I didn’t imagine it would come to that again. Maybe there’d be a headstrong occupation that would last weeks, but not much more. I hoped the governor’s threat of firing teachers after three days would end things peacefully, but no. That air of fomenting dissent and the harshed vibe, they never dissipated. It gave me an omnipresent sense of “something’s not right” I couldn’t define. I was left constantly ill-at-ease. Oaxaca, I decided, would be a place I’d long to return to one day, but also a place I could never live long-term in. Maybe I’m a sunny-side-up traveller. Maybe I seek good times and chill towns. I don’t know. Perhaps I’m less edgy and hip than other travellers who can abide contradictory experiences of dissent and inspiration. I don’t know, I don’t care, but I also doubt it’s that simple. Travel’s unique for all of us. 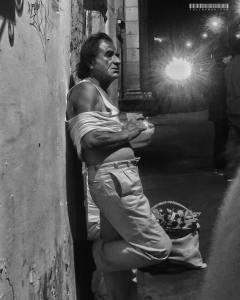 This man was photographed late on a night of drinking, and captures for me the mood I sometimes felt in the city. If I could only deal with HappySunshineTimes, I don’t think Europe would resonate with me like it does. I’ve already been places where discontent is palpable, like Porto, Portugal, and parts of Croatia. Decades and even centuries of oppression and loss fill the air. Discontent often seems akin to a shadow on the wall; always there but never detracting from the image as a whole. Same in Oaxaca, along with a hopelessness too. There, shadow overtakes image. One fella told me he didn’t expect to see corruption in Mexico, particularly Oaxaca, end in his lifetime, possibly not even his children’s. Corruption’s so interwoven in the culture, over so many generations, that it may as Mexican as a good salsa. Maybe I’m just new to worlds comprised of often-bloody histories that unfurl from oppression and revolution. Perhaps the lustre of my innocence will dull as I compile passport stamps and experiences over the years. Maybe. I don’t know. I know I’ve said that a lot today, “I don’t know,” but the worst I’ve ever seen was a hockey riot or two. So I’m processing this aloud for your benefit, and for my own in the years to come. Today is a new landmark in my travels, the first time I’m aware of my good fortune to miss an unsettling turn in a recent location. Oaxaca is a wonderful, amazing, complicated, challenging, inspiring place to be, and it deserves better than a corrupt government and violent interludes. It’ll always be a place where I sort of came of age, in a way, with eyes opening as to just how complicated our world is. And how almost spoiled we are in my hometown, Vancouver. We Canucks complain about corruption and shadiness in our lawfully elected government, but, geez. 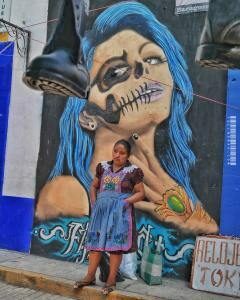 In the Oaxacan valley town of Tlacolula, this woman epitomized to me the beautiful culture contrasted with the despair some seemed to feel. That’s such a contrast to my Oaxacan tour guide fighting tears, raging that June 5th would be the first time ever she wouldn’t vote, because “Why bother?” The governor’s race was fixed, she said, its winner a foregone conclusion, despite the widespread strife. I thought of all the voting-apathetic types at home and how naïve they were about “corruption”. 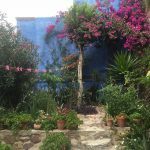 My definitions of many words – like corruption, poverty, and beyond – have changed dramatically in my nine months of travel. People say you don’t know how good you have it until you travel abroad, and it’s true. The incredible gratitude and generosity of these struggling people is a lesson to us all. Whether under the legacy of civil war in Croatia or here in Mexico, there is love, kindness, giving, and happiness to be found all around. These people have taught me much about how little I really need for contentment. I’ve learned to live with less and enjoy moments as they come. I feel I’m often in macro-moments, able to disregard larger pictures of discontentment around me. They have mastered this skill. With so much they’re unable to change, so much they can’t confront, they need to go on despite it. To give into defeat and hopelessness daily would be too toxic a life to live. It’s like there’s a duo-reality in these places. The macro-reality is akin to a horse running through life with blinders on to keep outer distractions minimized. Then there’s a fish-eye-view of peripheral madness ever-tainting minor day-to-day workings; this makes little moments matter more, out of sheer resignation against the big picture.. This adds up to a gratitude one can’t buy. I have endured adversity and struggle that taught me these lessons in my younger years, sure, but it’s an education of a different ilk on the traveller’s trail. It’s a sadness that can’t be shook, a gratitude that digs deep. It’s also a growing love for people shaped by time and struggle, and their determination powering them through oft-futile-seeming day-to-day. Oaxaca broke my heart today, but if there’s anything I know, it’s that the city and its people will continue to celebrate who they are despite it all. They are the match to the powder-keg of Mexico’s ongoing fight against corruption. They’re a place unique to the country. Their fomenting discontent is as much a part of their DNA as corn and mole sauce are. 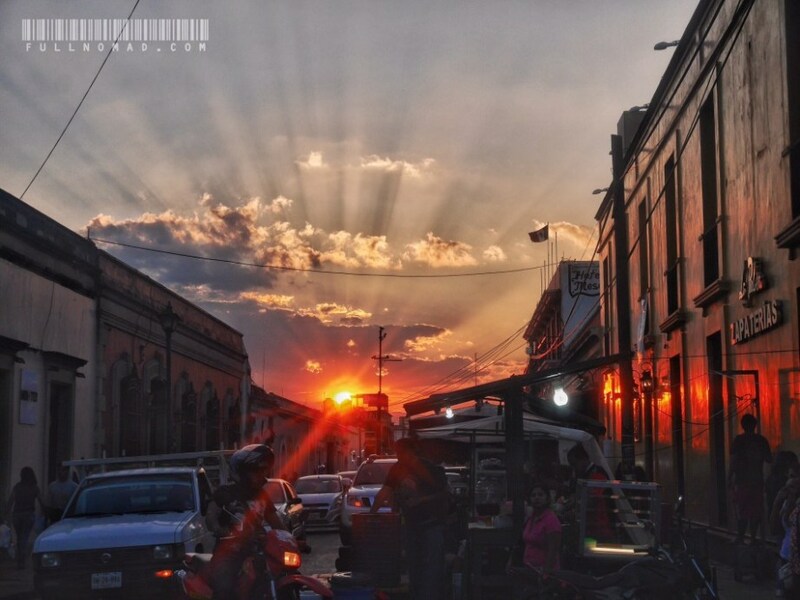 Oaxaca is a place like no other, and that’s unlikely to ever change. I’m proud I spent time there. I’m glad I saw something of its people and culture. I will return. Viva la Oaxaca. Enjoyed reading this? Pin it! I love the way you write and your honest analysis, which is missing in most blogger’s descriptions of places. 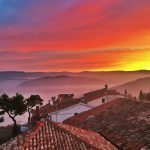 My wife and I are also Canadian (although she was born in the US) and have travelled full-time now since 2014. I think we’ve been to many of the same places: I’ve quickly looked through your site and seen mentions of Pula and Rovinj (we’ve spent 2 months in Croatia each of the last 2 years) and Mexico. I visit my mom who lives there (in San Miguel actually), I think its been 4 years now. On one of those visits we visited Oaxaca and I think you’re the first person who’s been close to summing up my feelings on the place. Yes, culture and great food – but omnipresent poverty and inequality which just wouldn’t have made it a place I could ever spend too much time in. Incidentally, I was in Morelia just a couple of months ago when we almost got stuck there by the teacher’s protests. Just made it out before they jammed up all the routes in and out of the city center. I saw a mention somewhere that you’ll be going to the Czech Republic. It was where we started out full-time travel lifestyle 2 years ago, spending 3 months there. We’ve since spent 1 week and then 1 month there. Beautiful city, inexpensive, good place to catch up on dental work…and there’s lots to see outside Prague (though I don’t know if I could actually live outside Prague). I’m glad someone agrees with me on Oaxaca. I feel like such a freak that so many travel bloggers are laying down roots there and calling it the next Barcelona, when I can’t fathom living there long-term. But maybe I’m a more sensitive soul. I don’t know. It’s nice to see others have felt the same apprehensions. I’ll be going to the small town of Cesky Krumlov for 24 days then returning to Prague for three weeks before heading to the Greek Islands for a slightly warmer Christmas and January. I’ve dreamt of seeing Prague for nearly 25 years, so I’m SO excited.